knock 'im doon, but doan't 'ot 'im"
Every January, the parish of Haxey goes a little crazy for the day. 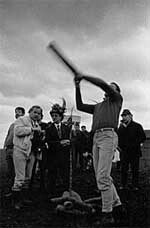 They play a mad game called the Haxey Hood and have been practicing this ancient tradition since the 14th Century. It's the oldest local tradition in England. 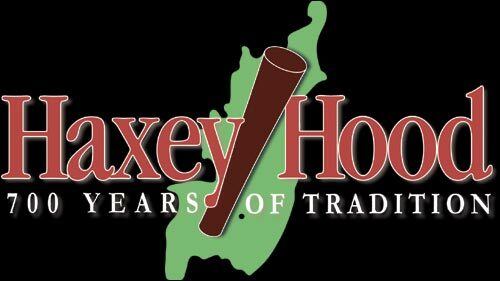 In a Nutshell	 The Haxey Hood is a annual event held in the village of Haxey, North Lincolnshire. It is most easily described as a kind of rugby game with unlimited participants and few rules, where a leather tube is slowly walked by a large unorganised rugby scrum to 1 of 4 pubs. Here it it remains until the following year's game. The official story is that in the 14th century, Lady de Mowbray, wife of an Isle landowner, John De Mowbray, was out riding towards Westwoodside on the hill that separates it from Haxey. As she went over the hill her silk riding hood was blown away by the wind. Thirteen farm workers in the field rushed to help and chased the hood all over the field. It was finally caught by one of the farm workers, but being too shy to hand it back to the lady, gave it to one of the others to hand back to her. She thanked the farm worker who had returned the hood and said that he had acted like a Lord. Whereas the worker who had actually caught the hood was a Fool. So amused was she by this act of chivalry and the resulting chase, that she donated 13 acres of land on condition that the chase for the hood would be re-enacted each year. 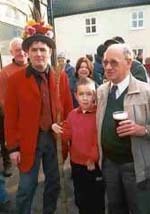 This re-enactment over the centuries has become known as "The Haxey Hood"
Preparations	 In the weeks before the event the Fool and the Boggins tour nearby villages in order to collect money (traditionally to pay for the event, but now to raise money for local charities). Traditionally they sing a number well-known folk songs including John Barleycorn, Drink England Dry and The Farmer's Boy. All wear their full festival costumes, the only exception being that the Fool's face is not marked. 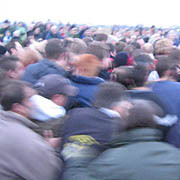 At twelve noon work in the parish comes to a standstill and people start to make their way to Haxey village to gather and take part in the traditional ritual. At approx. 12.30pm the officials start a tour of the ale houses involved, and drink free drinks at each pub, provided by the landlord as a token of good luck to try the bring the Hood its way. Many people follow this tour and consider it a vital part of the day. They start at the Carpenters Arms were they sing the traditional folk songs and ceremoniously mark the Fool's face. Then they move to the Kings Arms and then up towards the church taking in the Loco and the Duke William on the way, drinking and singing as they go. Around 2.30pm the officials exit the Duke to the street and walk in procession up to the church. "Hoose agen hoose, toon agen toon, if a man meets a man nok 'im doon, but doant 'ot 'im"
The Town�s being the villages of Westwoodside & Haxey, and House�s being the Public Houses (Pubs) of those villages. After the speech, the Fool leads the crowd to the middle of a field where the game is to be played. Proceedings start with the throwing of twelve Sack Hoods. These are rolled Hessian sacks sewn up to prevent them unrolling. This is a prequel to the main game, mainly for children. The youngsters in the crowd run for them when thrown and attempt to get them off the field. If they are tackled then they must immediately throw it in the air unless the challenger is a Boggin in which case the hood is �boggined� and it is returned to the Lord who starts it off again . The first two or three of these are stopped by the Boggins on the edge of the field and the hoods returned to the Lord. After a while the Boggins let the Sack Hoods be taken off the field in which case they can be returned later for a cash reward, currently £2. The Main Game	 After this bit of fun to warm up the crowd the Sway Hood is then thrown up in the air. The rugby type scrum (or Sway to give it its official title) then converges on the Hood and the game starts in earnest. The idea is to get the Sway Hood into one of the four Pubs in either Haxey or Westwoodside. The Hood, which cannot be thrown or run with, is moved slowly by 'swaying', that is pushing and pulling the Hood and people within the 'Sway' toward the direction of their pub. Although everyone is trying to push in a particular direction, there are no real organised teams. The Sway makes very slow progress, as it snakes around, stopping quite often when it collapses, in order to pull bodies out, that became crushed into the mud. Safety is of prime concern and the whole thing is supervised by the Boggins. The Lord is referee and sees that the game is played fare. At anyone time there is usually around 200 people in the Sway and about one thousand people watching. Games can last anything from a couple of hours onwards and have been known to go on well into the night. Everything in the path of the Sway goes down before it, including hedges and walls. Another of the Boggins' jobs is to stop the Sway destroying everything in its path! The game ends when the Hood arrives at one of the pubs and is touched by the landlord from his front step. The landlord then takes charge of the Hood for the year, and is supposed to give everyone a free drink. The winning pub pours beer over the Hood and then hangs it behind the bar (each pub has two hooks especially for this purpose). According to legend it used to be roasted on a spit over the pub fire having been doused with ale. The ale then being drunk by those present. The Hood hangs there until New Year's Eve when it is collected by the Boggins in time for the next game. Despite it being a very rough game there are very few injuries and little damage. Most injuries that there are come from too much beer before or after the game whether it be the winners celebrating or the losers commiserating. The event is as much about the drinking in the pubs as anything else. Just as with Christmas Eve or New Year's Eve, more ale is probably drunk on Hood Day, and Hood Eve in Haxey, as any other. The pubs are always heaving. The landlords prepare for this by covering their carpets with thick black plastic, to protect them against all the mud that will come off the fields on people's feet from the game. 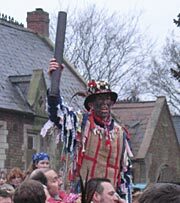 When	 The Haxey Hood takes place on Epiphany, the twelfth day of Christmas (new calendar) or Old Christmas Day (old calendar). This is the 6th of January. If this falls on a Sunday, it is held on the 5th. Where	 Haxey is a large parish on the southern border of the Isle of Axholme. It consists of the villages of Haxey and Westwoodside with the hamlets of High Burnham, Low Burnham, Eastlound and Graiselound (or Craiselound as it is referred to by some people). In earlier days Westwoodside was divided into Park, Newbigg, Nethergate, Upperthorpe (or Overthorpe) and Commonside. Nobody parks on the roads where the Sway may go, and for good reason. In 2002 a couple of unfortunate souls parked opposite the Duke William. The Sway headed right for them and pushed one of the cars 10 feet down the road and into the other! If you want to have a car left to go home in, then make sure you don't park on the Main Street through Haxey. The thirteen characters from the original story are represented as follows. There is the Lord, the Fool and eleven Boggins; one of the Boggins being the chief Boggin. The Lord and chief Boggin are dressed in hunting pink (red) coats and top hat decorated with flowers and badges. The Lord also carries his wand of office. This is a staff made from twelve willow wands with one more upside down in the centre. These are bound thirteen times with willow twigs and a red ribbon at the top. The thirteen willow wands are supposed to represent the twelve apostles and the upside down one represents Judas. The staff is supposed to represent the sword and the blood from when the game was played with a bullock�s head after it had been slaughtered. 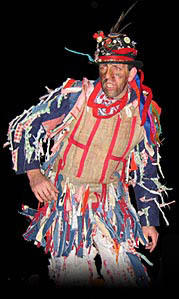 The Fool is like a harlequin, with multi-coloured strips of material attached to his trousers and top. He wears a feathered hat decorated with flowers and rags, and his face is smeared with soot and red ochre. He carries a whip and sock filled with bran, which he belabours anyone who comes within reach with. 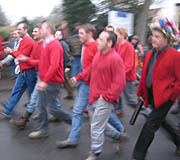 The remaining ten Boggins wear red jumpers. Teams	 The game is played by locals, although anyone can join in. There are no official teams, but everyone involved tries to push the Hood towards their favoured pub. In folklore, when a custom is too old for its origins to be remembered, a story is often devised to rationalise what would otherwise be baffling. The 'official' story of the Hood's origins are unlikely, but strangely enough there are parallels between the Hood and bog burials in Europe. The game takes place on the border of bogs where naturally-preserved mummies of prehistoric sacrificial victims have actually been found. The game takes place in midwinter, one of the traditional times for sacrifices, so perhaps the smoking of the Fool is symbolic of a sacrifice? The sticks that the Chief Boggin holds may be a remnant of the sticks frequently found with the bog mummies, but the leather hood may be the most significant link of all - several bog mummies have been found with leather hoods tied to their heads. In fact, the origins of this rowdy village battle are obscure. 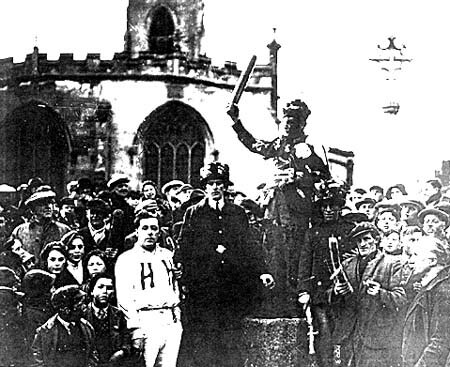 It has similarities to other village combats, such as Asbourne's Shrove Tuesday Football and the Hallaton Bottle Kicking contest in Leicestershire. The nobles mentioned in the story did exist, see further reading for details. Left to right: Phil Cogan - Lord for the past fifteen years, Luke Cogan - future Lord?, Stan Boor - past Lord for 24 years. Very old photo of the Hood. I created this page in response to the fact that when I started looking on the Internet for info on the Hood, I found a lot of misleading and conflicting information. I've lived just South of the Isle for most of my life and I wanted to create a definitive explanation of what the Hood was all about - it's hard to explain to anyone who's not from the locality. This is my interpretation of what the Hood is all about, pulling together others explanations, with a little of my local knowledge of the event. If there's any factual errors, then please let me know (my email address is on my home page, click here). All photos where taken by myself unless otherwise stated (roll mouse over photos for credits). The Hood logo was created by myself, and whilst I retain copyright on this design, I'm quite happy for it to be used for anything to do with the Hood, as long as it is not used for commercial gain. If you want a better quality version, then please email me. I've created a stripped down version of this page on Wikipedia, the net's free encyclopedia. 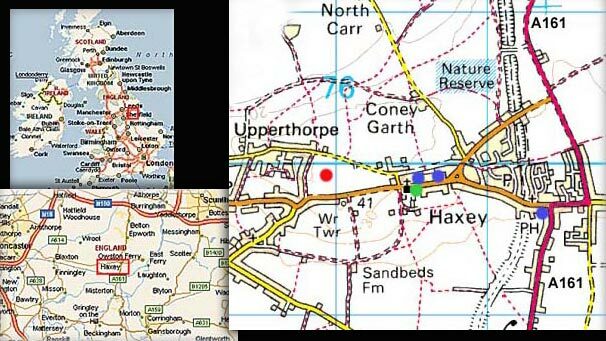 This page can be found at http://en.wikipedia.org/wiki/Haxey_Hood and was originally uploaded there on 15th August 2004 - since then it's taken on a life of it's own with others contributing more recent photos, etc. That page links back here in Local Info at the foot of the page. Mark at Intripid TV - tour info in 2003.